Need Some Valentine's Day Inspiration? Our Blog Hop #7 is Here! Holiday Hosting at Home #7: Need Some Valentine’s Day Inspiration? A while back, I started a blog hop with two very talented friends that I met on social media. Like me, they love to host friends and family at their home and relish in making guests feel welcome. 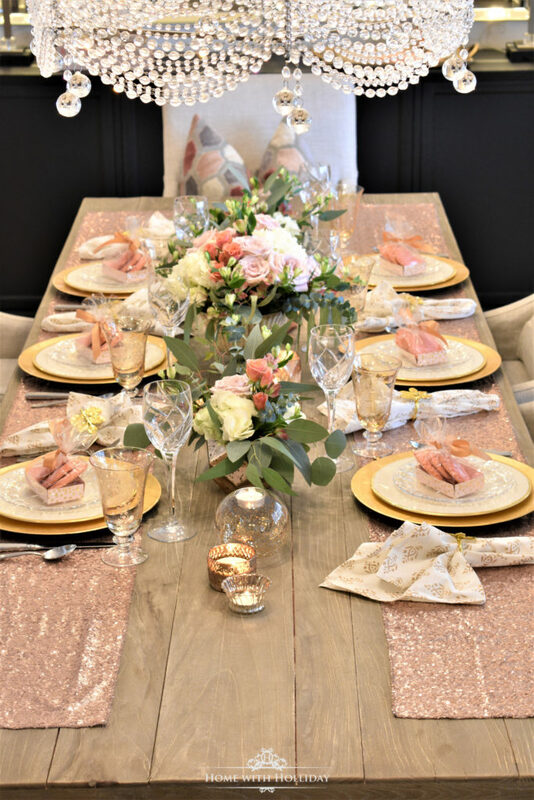 Whether it’s a beautifully set table, a home-cooked meal or a pretty coffee table, we all love to entertain and share ideas so others can be inspired to entertain in their homes as well. Now that we’re past the traditional holidays, we’re focusing on Spring holidays for the next few months. First up: Valentine’s Day Inspiration! 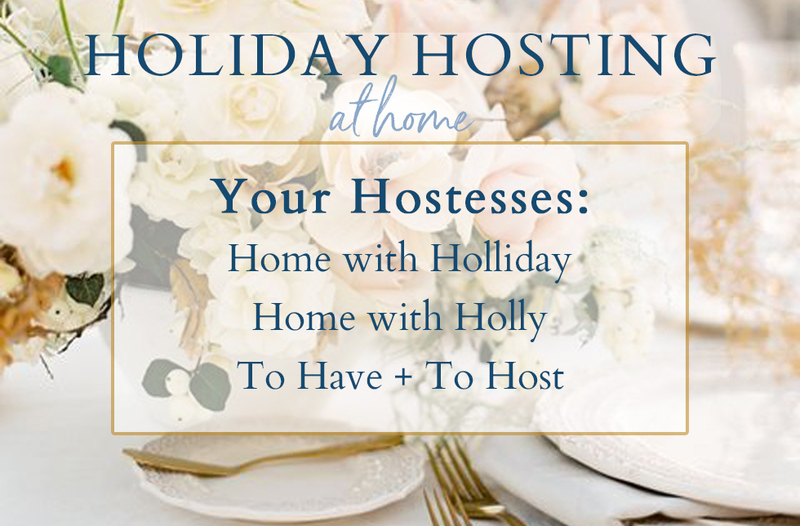 I’ve joined forces with two very talented ladies to bring you ideas and inspiration for hosting in your home! 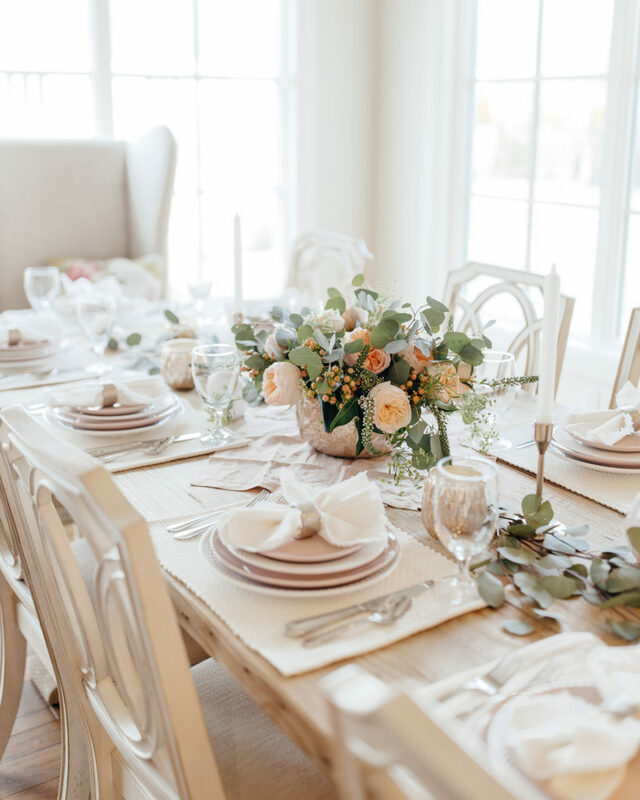 How creative is Holly’s use of two table runners down each side as a long placemat? I’m copying this idea for sure! 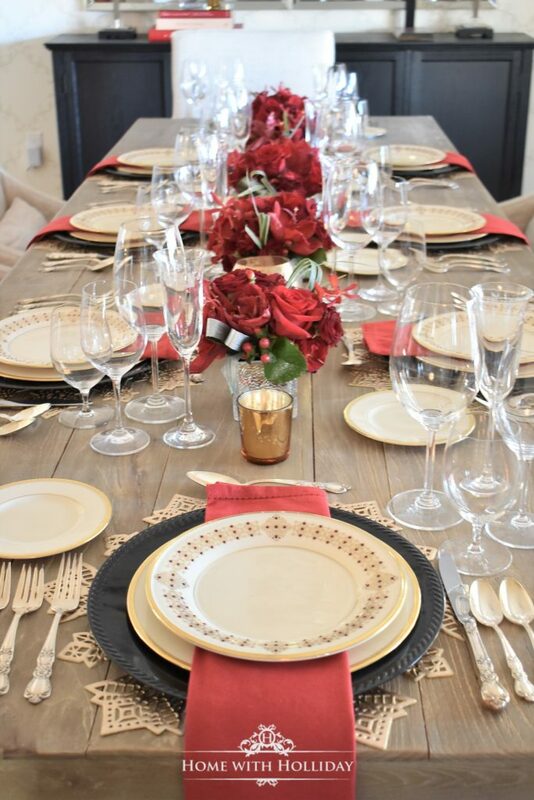 Beautiful and elegant, this red, black and gold table is a gorgeous setting for a Wine Tasting party! Dying over these adorable mini-bundt cakes flavored with cherry chips and drizzled with pink icing! Why not celebrate the girlfriends in our life and the relationships that mean so much to us? 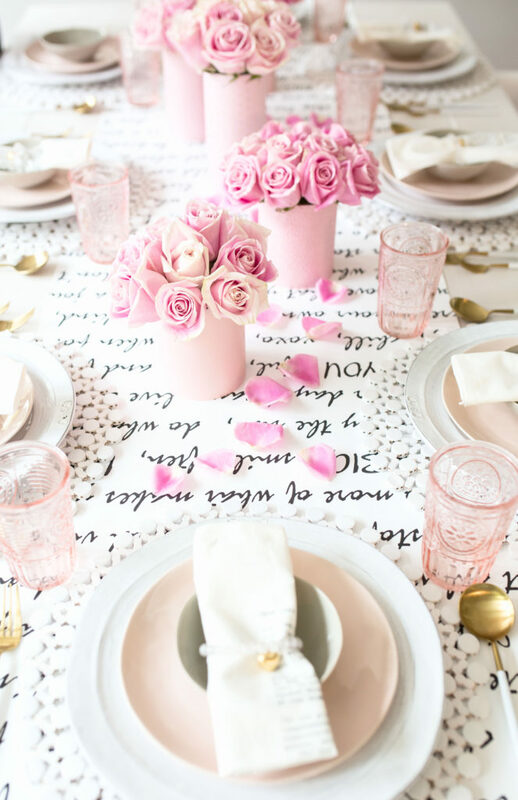 That’s why I wanted to throw a Galentine’s Lunch, complete with a pink and white table, delicious comfort food and a bespoke bracelet as their gift. 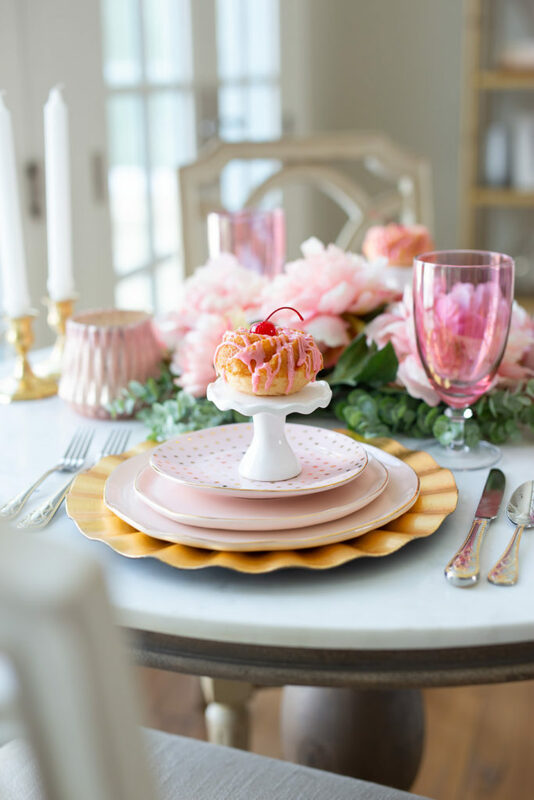 Click here to see the entire Galentine’s Lunch post! I used a roll of wallpaper for lay table runner! Super easy to roll out what I needed and cut off! Most of my friends and family know that baking is not my forté, so I usually enlist help of friends to bring dessert. 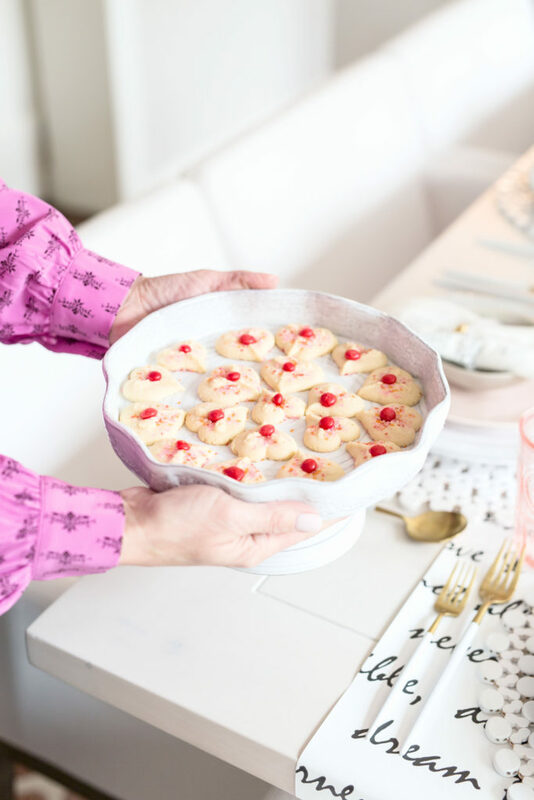 My friend Katie made these adorable (and delicious) heart-shaped pressed cookies topped with a cinnamon red hot – how’s that for some Valentine’s Day inspiration! Here’s the link to the Buttery Spritz Cookies. Thanks for visiting! I sure hope we’ve given you lot of Valentine’s Day inspiration so you can celebrate your loved ones with lots of fresh ideas to use! Come follow us and our individual journeys – link below. Thanks Leslie!! This was a fun to table to do! !